Though Apple's iPhone 5 and iOS 6 will get most of the attention from today's press conference, they weren't the only stars of the show. 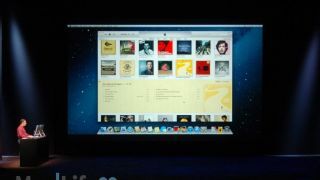 Apple also introduced a major revamp to their iTunes service, set to arrive in late October for Mac and PC clients. The latest updates to what Apple called "the world's most popular media player" will incorporate plenty of cosmetic and interface changes, as well as a few new tricks to make the existing package even more impressive. With more than 200 million people using iTunes on the Cloud, it should come as no surprise that Apple will include better iCloud integration when the update arrives. No matter where you bought your music, movies, or books on iTunes, iCloud will seamlessly incorporate that purchase into all of your libraries. More importantly, you will now be able to continue watching or listening to movies and music exactly where you left off, and you'll be able to resume playing your media on any device with iTunes. Once the October update arrives, iTunes will ditch the sidebars in favor of a full-window interface. The new grid-style view for your library will allow you to see everything you have in a specific category, be it movies, music, TV shows, or books. Clicking on an album will let expand the screen to show you a track listing, all the while keeping the rest of your library in plain sight for continued exploration. There's also an all new MiniPlayer, which will give users the ability to listen to and search for new songs without having to open their entire library. Additionally, iTunes will add Up Next, which will offer improved insight into what songs are coming up in the playlist, and will allow you to change your queue without much fuss. The Mac and PC versions of iTunes aren't the only ones getting a bit of polish. Coming along with the Sept. 19 iOS 6 release is a new version of iTunes for all iOS devices. Since 60 percent of all iTunes downloads come from mobile devices, it certainly makes sense for Apple to continue their redesign across all their brands. iTunes will incorporate a carousel view, and the new library view will be utilized across music, movie, and book stores. You'll also be able to continue browsing the store while previewing a new song, and will allow you to share your media selections on Facebook and Twitter. With a new wave of iPods also on the way, this iTunes update couldn't be coming at a better time.